The easiest access from Phoenix is from Interstate 17 (I-17), west onto State Route 74 (Carefree Highway), turn right onto 87th Avenue (Pleasant Harbor Road), and then left into the Pleasant Harbor Marina. In Mapquest or Google, enter “Lake Pleasant Regional Park.” And here’s a map of the lake showing the names of coves and access points. And a better, big color one. There is a $6 charge to enter the marina grounds with (or without) a boat. After entering, turn left at the T intersection (the stop sign) to go to the South Ramp area where most AYC Members launch their boats. On race weekends, you’ll see a flock of AYCers setting up at Spinnaker Point (just to your left as you sit at the T after entering the grounds). If you turn right at the T, you’ll usually see the Thistles and others on the paved north lot, preparing to launch at the North Ramp. You can also launch from the county park boat ramps or Scorpion Bay Marina, but most AYC off-the-water activities happen at Spinnaker Point, on marina land, at the south end of the lake. 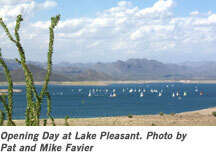 Here’s information on the county park and the Lake Pleasant area from Maricopa Parks and Recreation.